Ms. Jan Taylor VanBrackle, age 59, of Brentwood went to be with her heavenly father Monday, January 14, 2019. She was born March 8, 1959 in Nashville, TN to the late Virgil and Catherine Taylor. For over thirty years, Jan worked at Metro Health Department. Jan was a loving mother not only to her children but also to every person she had ever met. She was a devoted friend with an infectious laugh that would brighten anyone’s day. Jan had many friends and loved each and every one. She would take care of everyone else before she would take care of herself. Jan always cooked Monday night dinner for her children and everyone was invited. She enjoyed the small things in life and instantly built relationships. She would touch your soul instantly. Jan’s favorite holiday was Christmas. She loved it so much that she listened to Christmas music and had Christmas decorations year round. She also loved sending and receiving Christmas cards. Jan has a huge collection of snow globes and would spend all day at the Christmas Village. She was a thoughtful gift giver, spending countless hours looking for that perfect gift. 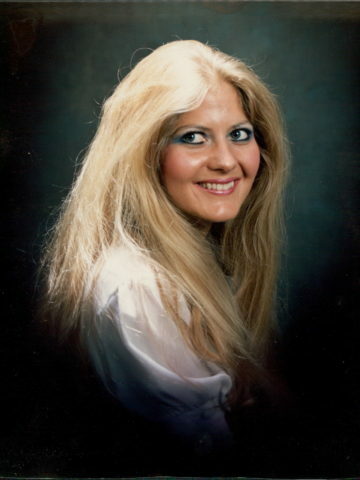 Jan had the most beautiful, thick long hair and loved everything glittery and sparkly, including her fairy hair. She was very fond of her cats; Buddy, Snuggie and Willie. Her favorite hobbies include playing putt-putt golf, watching The Bachelor, Lifetime, Hallmark and Dancing with the Stars. She also loved parties and weddings. Jan really enjoyed flip flops and wore them year round, even in the snow. She is survived by her daughter, Shannon VanBrackle and son, Brandon VanBrackle. The family will receive friends Thursday from 5 – 8 p.m. and Friday 1:30 – 2:30 p.m. at Harpeth Hills Funeral Home. A celebration of life funeral service will be held Friday at 2:30 p.m. in the chapel with Brother Clifford Dobbs officiating. Interment will follow in Harpeth Hills Memory Gardens. Donations may be made to the Ovarian Cancer Research Fund Alliance at ocrahope.org.